The 2019 Watercraft Inspection educational webinar series developed by New York Sea Grant and featuring coastal science and AIS specialists begins on January 17. Credit: NYSG. Newark, NY, December 13, 2018 - Newark, N.Y. The 2019 edition of the Watercraft Inspection Program Leader educational webinar series developed by New York Sea Grant and featuring coastal science and AIS specialists begins on January 17 and will connect participants from multiple states. Four sessions in the webinar series will address issues associated with recreational boating as a key pathway in the spread of aquatic invasive species (AIS), making watercraft inspection a critical contributor to limiting the spread of AIS among the more than 7,000 lakes, ponds and rivers in New York state and waters elsewhere. Participants can join any or all of the one-hour-long, free-access webinars available from 10 am to 11 am. Register and contact New York Sea Grant for more information at 315-331-8415, www.nyseagrant.org/watercraftinspection. “Watercraft inspection and the associated steward programs are critical components in protecting aquatic ecosystems and water quality. This webinar series brings program leaders together in an educational forum to learn from respected experts and to share their own valuable experiences,” said Mary Austerman, Community Development Specialist with New York Sea Grant and author of the New York State Watercraft Inspection Steward Program Handbook. Thursday, January 17: "Applying Behavioral Psychology to Stop AIS: Learn the fundamentals of creating behavior change through simple and proven methods of applied behavioral psychology." Presenter: Ken Donnelly, president, Beyond Attitude Consulting. Thursday, January 24: "NY Watercraft Inspection Steward Program Application 2018 Data Overview: Methods, Statistics, Analysis: Learn the latest information about a real-time data collection tool launched in New York State in 2017 to track and analyze AIS trends to aid prevention, education and response statewide." Presenters: Cathy McGlynn, Ph.D., Aquatic Invasive Species Coordinator, New York State Department of Environmental Conservation; and John Marino, GIS Applications Developer, and Forest Swaciak, Intern, New York Natural Heritage Program iMapInvasives Project Team. Thursday, January 31: "Assessing the Risk of Future Aquatic Invasive Species Establishment in a Changing World: Using projected changes to temperatures and precipitation patterns in Pennsylvania as new and complex challenges to those working in aquatic invasive species management, learn a process for assessing the risk of new AIS establishment under these climate scenarios and species that have already become threats." Presenter: Sara Stahlman, Extension Leader, Pennsylvania Sea Grant. 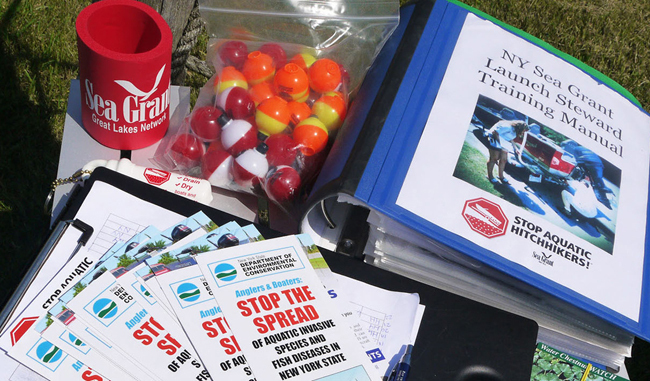 Thursday, February 7: "Dealing with the Public: Handling Harassment and Other Issues: Learn how training, awareness, and strong support from management serve as critical tools to keep watershed stewards safe throughout the boating season." Presenter: Sue O’Reilly, Data Manager, Adirondack Watershed Institute at Paul Smith’s College. This continuing webinar series offers watercraft inspection program leaders and those interested in developing a program the opportunity to learn about exciting, recent advances in aquatic invasive science. Watercraft inspection is an effective mechanism for public education about ecologically harmful aquatic invasive species. The standardizing of data collection by watercraft inspection programs across New York is enhancing the efficiency and efficacy of aquatic invasive species reporting, and encourages citizen stewardship of valuable water resources statewide. This is the fourth watercraft inspection program development seminar series developed by New York Sea Grant. The New York Sea Grant Watercraft Inspection Webinar Series since 2015 is online at www.nyseagrant.org/watercraftinspection.